In college, I had a roommate, Bill, who was an electrical engineer. But beyond majoring in the subject, it was his hobby and passion as well. Consequently, the various hellholes in which we lived were littered with electronics and computer-related projects. He was into building practical things (uninterruptible power supplies) and impractical things (really loud amps, handheld lasers). 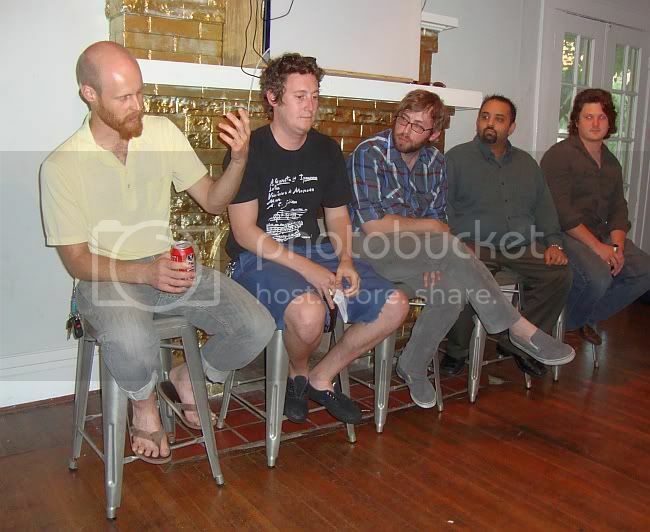 This was a million years ago, and now Bill runs a successful electronics manufacturing company here in Houston. But I was reminded of his younger self when I saw Input/Output, the installation by the artist/engineer collective Exurb. This is the kind of project Bill would have eagerly joined back in the day. The first thing one sees when walking into the Joanna are two plexiglass post-and-lintel constructions, called "doorways". The first thing you notice, however, is a caterwaul of noise. The noice is coming from the speakers on the doorways. The plexiglass construction allows you to see that there is electronic circuitry inside the doorways. But it's not circuitry that most viewers might be familiar with from looking at the circuit boards in their computers or other electronic devices. These are old electronics--vacuum tube technology. The members of Exurb commented that all the parts could have been bought fifty years ago. The basic technology here is the theremin, which was invented in 1920. A theremin operates by changing pitch (frequency) and loudness (amplitude) using variable capacitors. The body of the player is the grounded plate in the capacitor, and the distance between the body and the antenna changes the capacitance which is used to vary the sound. In this device, the theremins (there are three on each post) only change frequency. The antennae are these checkerboard metal plates on the inside of each doorway. Passing through the doorway brings you close to the plates, causing pitch changes. 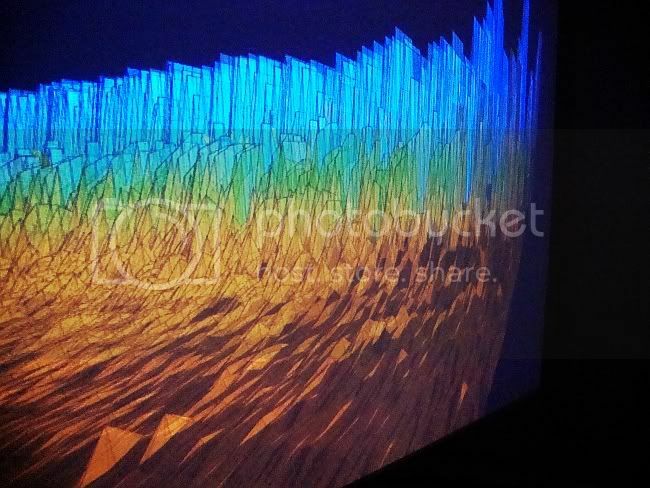 I don't have a photo of the histogram screen, but it's the least interesting--it seems more like a device to help the artists monitor the functioning of the various devices. For this dynamic data visualization, the Y-axis is amplitude, the x-axis is frequency, and the z-axis is time. This graph was continually renewing, and because of the way it was visualized, time seemed to be receding into the past. The members of Exurb wanted a video that looked like night vision. But it's not real night vision. The green cast is somehow affected by the sound input, but I'm not sure exactly how. It otherwise seems like a green-filtered video of what is happening in the doorways room. 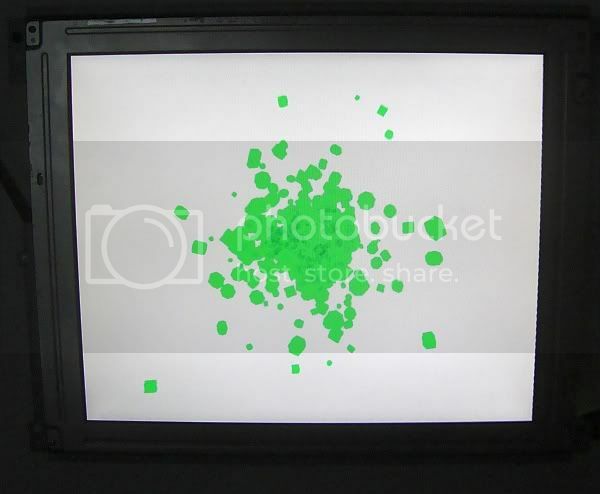 Exurb member Sam Singh told me about the screen with the exploding green balls. "As the change in frequency is higher, the force with which the balls break up is greater." After they explode apart, they fall back into place and the process starts over. 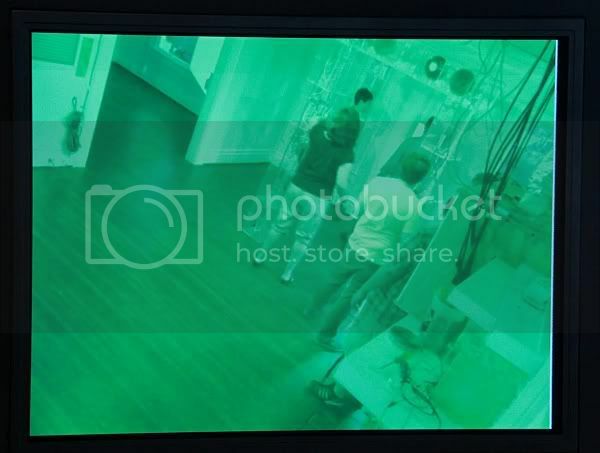 This screen displays video from the "doorways" room, but like the green screen video, this video is altered by the sound. The flat, high-contrast areas are determined by some criteria that I don't quite understand, and the color of those areas is determined by the frequencies of the sound input. The last output takes the video feed, turns it into a super lo-res image in which every pixel becomes a geometric shape, and overlays those "pixels" with another geometric shape that is determined by the sound input. At first, it is hard to see that it is actually video--it seems like a gridlike, constantly-changing abstract pattern. But after a while, you realize that the motions you see look like people walking across the room. This photograph shows one other way that viewers can provide input--the lowest-tech way of all. They can cast shadows on the screens. Input/Output evokes several reponses. One thinks of surveillance, for example. There is a notion of technological history, using analog and digital technology in one object. What I experienced most powerfully is the post-modern idea that art should not be separated from life. Thomas McEvilley has written that in Western art, there has been a long separation of art from the cognitive and the ethical--that the aesthetic was a completely separate category. This separation was carved in stone, so to speak, by Kant. While in a practical, lived sense, this separation has never been absolute--after all, French viewers of The Oath of the Horatii in 1784 saw more than an arrangement of colors and lines; they also saw a powerful piece of propaganda, but one that could be read in different ways by different viewers in relation to their own lives. That said, the autonomy of an artwork--its existence and meaning regardless of who (if anyone) was viewing it, was something taken for granted. Modernism was propelled in that direction. Hence the neutral white box for displaying art. Hence the banishment of subject matter. Postmodernist art attempts by various means to rebridge that chasm between the aesthetic and life. One obvious way to do so is to involve the "viewer" is the creation of the work. 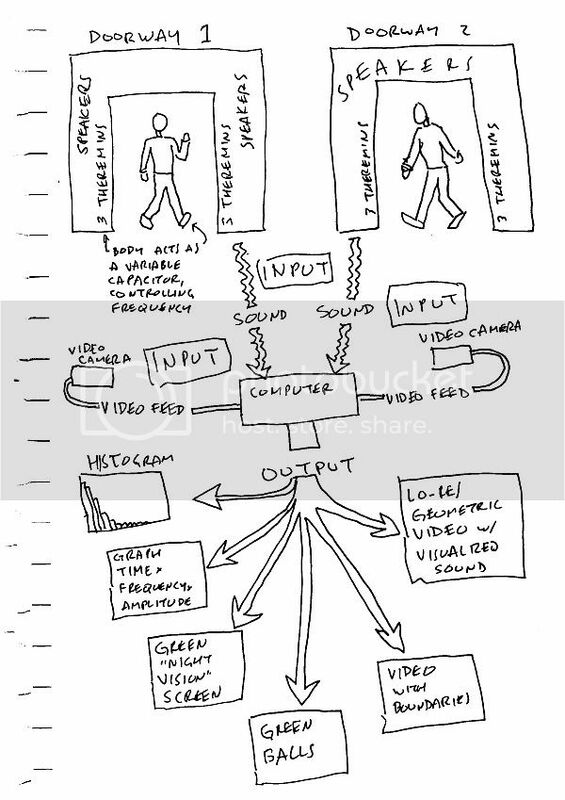 The viewer of Input/Output is not a passive receptacle of visual or sound information. She is as involved with the creation of the visuals and sound as the artists are. Likewise the artists dive into life by involving engineering (and engineers) in the creation of the piece. This breaks down the distinction of who is and who isn't an artist. Each of the members of Exurb brings a different skill-set and point of view. Patrick Renner is a sculptor (whose work is all over Houston right now--some of it is visible at Williams Tower through July 20, and some downtown at the Blaffer Gallery's Window in Houston space.) Eric Todd gives this self-description: "I personally dabble in a little bit of everything. I got a BFA from UH in Theater and Creative Writing in 2007, have had a few installation pieces of my own in the past (two at Lawndale in the last few years), run a recording studio, am a regular contributor at red94.net (the Houston Rockets ESPN affiliate), am a staff editor at Nano Fiction Magazine (nanofiction.org), write a poetry blog that I don't keep up with as much as I should (giddyox.net), and am (though I think all of us would object to any of our number claiming such a title) the sort of de facto foreman of Exurb." Johnny DiBlassi is a multi-media artist. Sam Singh is a software engineer (and describes himself on Twitter as an "engineer, philanthropist, writer, and self-proclaimed tech aficionado"). Stephen Kraig is an electrical engineer whose day job involves designing vibration sensors for industrial motors but who has a side business building guitar amps. This team strikes me as very corporate in the best sense of the word. Renner and Todd conceived the project, and Todd acted as team leader, but the team is collectively responsible for creating the work. When you think of artists like Matthew Barney or Jeff Koons or other artists whose work is the result of many people's labor, you see a tendency to ascribe credit to a sole auteur. Input/Output could not have been made without the contribution of each member of Exurb, and credit goes to each member. 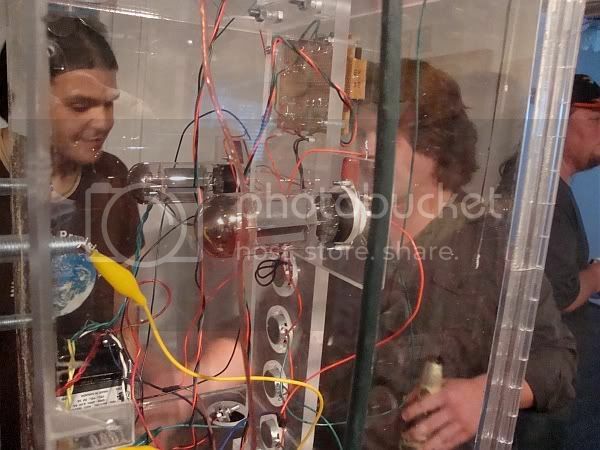 Input/Output is installed at The Joanna and can be seen and heard through July 16.